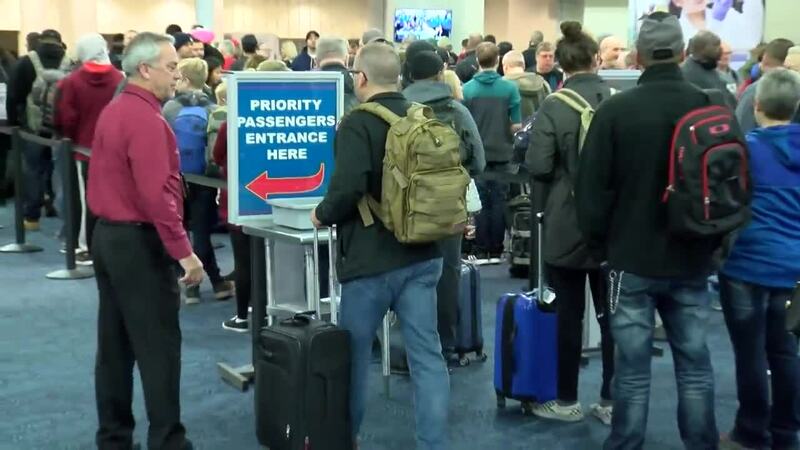 MILWAUKEE — Things are running smoothly, but there is a heavy increase in travelers going through Mitchell International Airport for the holiday weekend. "We're looking at about 11,200 departures," said Mark Lendvay, federal security director, TSA for Wisconsin. "Tomorrow, we're looking at 11,300 to 11,400, which for a Saturday is pretty busy." Lendvay says there was about a 3 percent uptick Friday, but the Saturday rush could lead to a more than 30 percent increase in travelers. So, despite the rough weather expected on the coasts, he suggests coming to the airport early to avoid any delays in getting to the gate. There was a large rush between 4:30 a.m. and 5 a.m. Friday. The lines wrapping around the TSA checkpoint were filled with passengers. However, by 6 a.m. the rush had dissipated. "Everybody arrived early," Lendvay said. "That's why you saw the line you did. Everyone was fairly relaxed because they had the extra time once they got through the screening process to stop and hang out at the gate before the flight departed." It wasn't just an influx in passengers leading to the delays in security. "Our pre-check population goes down about 25 percent," Lendvay said. "What that does, it puts more volume in what we call our standard lanes. Because of screening procedures being different, you'll see the efficiency piece not as increased as it is in pre-check." Enrolling in TSA pre-check costs $85 and lasts five years, Lendvay said.